It’s not a secret, but it certainly is a best-kept area – especially for camping. Bishop Creek Canyon is a large area of about 30 square miles where the North, Middle, and South Forks of Bishop Creek drain down toward the Owens Valley. At the head of each fork is a large lake, North Lake, Lake Sabrina at middle, and South Lake and numerous other smaller lakes lie along these creeks. The area is managed under the auspices of the US Forest Service (USFS) and it maintains 12 campgrounds along the roads that lead up to these lakes. With a range of sizes and services these campgrounds offer a great variety of camping in exquisitely beautiful settings. Within as little as 13 miles from Bishop to the furthest only 20 miles away this canyon, the surrounding mountains, and alpine forests will give you the feeling of being worlds away. Easy access to stream and lake fishing is a big draw for visitors and locals alike and yet solitude is also easy to find. Numerous trailheads begin in this canyon where you can truly get away from the pressures of daily life and into the adjacent wilderness. Each season holds a promise of something adventurous and exciting, but the summer months are when this canyon delivers nature at its most rapturous. The air is cool up here, the wildflowers blossom much later than in the valley, and on a cloudless night the sky is as brilliant as a fireworks display. The forest creatures allow us a grudging intrusion into their world and it is important that you are “bear aware”. All food must be secured overnight and when not attended, bear boxes are provided and must be used (typical bear box size 48″ x 30″ x 36″). Always keep a clean camp and do not feed wildlife. Overnight wilderness trips require a wilderness permit. Find out more here. Here is an overview of all the USFS campgrounds in this area so you can choose just the right place for you, your family, or large group. Download this handy guide to keep with you. Click on each campground heading for a link to more specifics on that campground. Just 13 miles from Bishop this is the first campground you’ll come to. As it is frequently below the snow line or only has minimal amounts of snow it is open year round. Drinking water is available and 2 vault toilets are easily accessible. Bins are provided for trash and serviced during the summer months. There are 30 campsites and most will accommodate 2 vehicles or a tow vehicle with trailer. The sites are wide, clear and level and each has a bear proof food storage container. Campground usage is light and it’s a super spot to escape the summer heat of the valley. 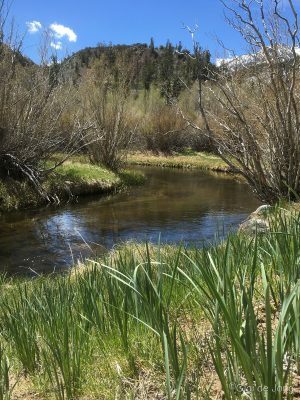 It’s near town, alongside Bishop creek and close to the trailheads that take you into the wilderness. As the road climbs up the mountainside it offers a birds eye view down to this campground and still the tops of Jeffrey Pines growing in the campground are at driver’s eye level. It is for these large, magnificent trees that this campground is named. It is a popular campground with some sites in the cool shade and others in open sunlight. It offers 16 campsites, drinking water, trash service, one flush toilet and one vault toilet. 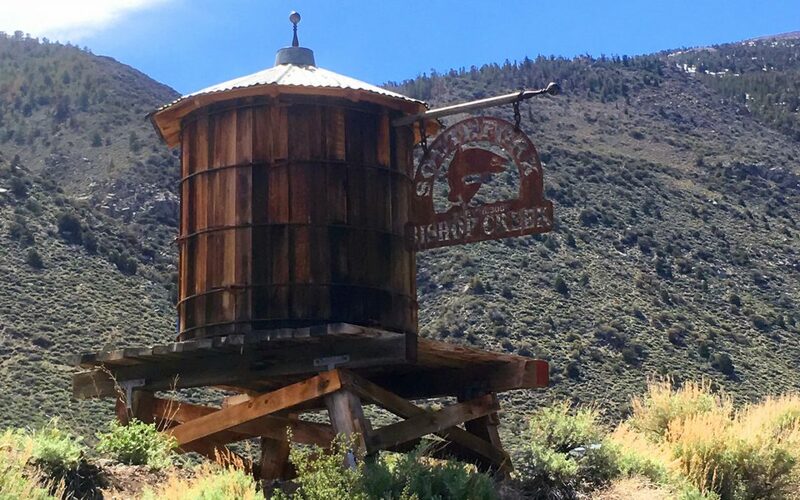 Still close enough to Bishop, just 14 miles from the center of town, this campground nestled in this deep canyon affords one the luxury of space, an alpine environment, a fast flowing stream stocked with trout, and quiet nights under a bright canopy of stars. 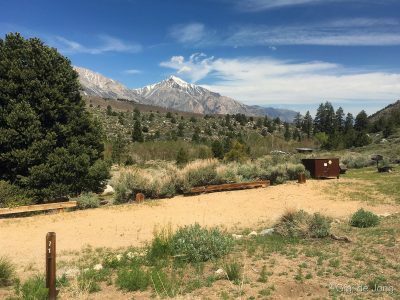 Situated near the junction of Middle Fork and South Fork of Bishop Creek this campground has 21 sites available during the summer season. From Highway 168 about 15 miles from Bishop turn left onto South Lake Road and almost immediately turn right into Forks Campground. The sites here also offer a mix of shade and sun with some tucked under tall pines and quaking aspen. 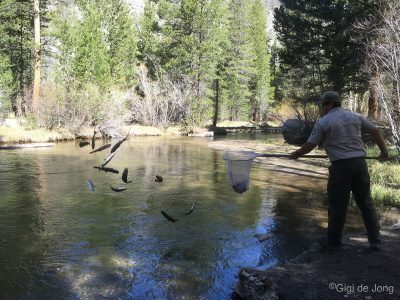 Forks is just a short walk to Intake 2, along the banks of Bishop Creek Middle Fork, where fish are plentiful. A large rocky outcrop is perfect for practicing beginner rock scrambling and climbing skills. If you’re looking for a day outing in the mountains this campground also has picnic spots for day users. This campground boasts 106 sites most with spectacular views across the canyon. Many of the sites are long enough to accommodate even the largest of RVs. The pads are clear and level and the sites spacious. Some offer shade and many are very suitable for tent camping. 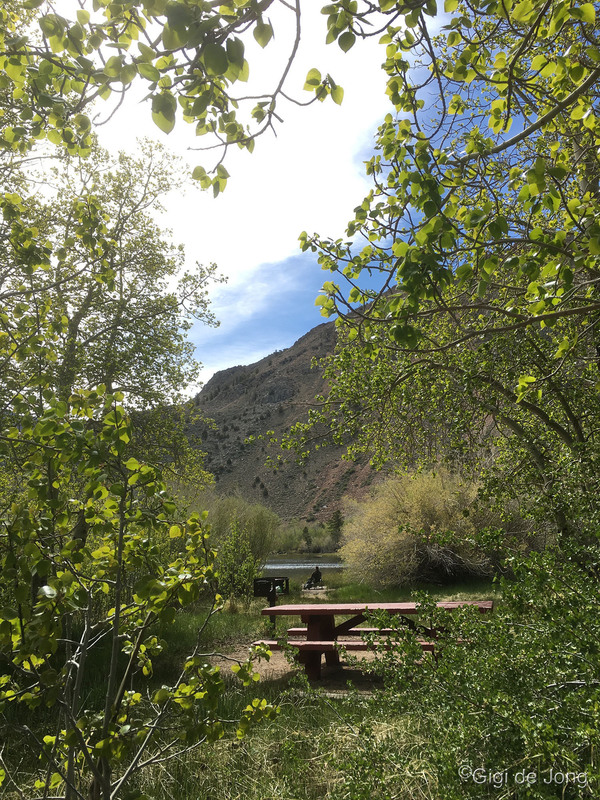 Located along Bishop Creek South Fork this campground is open seasonally, by the last weekend in April, and some sites may be reserved in advance. Although large, Four Jeffrey still has a wonderful secluded feeling. The campsites are stepped up the hillside and the campground is fairly well hidden from the road view by thickets of aspen and pinions. If solitude is what you’re after this is the campground for you. Just 5 campsites are perfectly spaced in a grove of aspen and willows. Parking is limited and sites are suited for tent camping only. Each site has a bear proof food storage locker and picnic table. The campground has one vault toilet. With just the bare necessities this is where you could prepare yourself for a wilderness hike or unwind from the complexity of city life. The campground is open seasonally and at the time of publishing this article the campground was not yet open. A short walk from the parking area along South Lake road is a beautiful walk-in, tent only group campground. Available by prior reservation only it accommodates up to 25 campers. One vault toilet is provided, but all drinking water should be carried in or filtered from the creek. The site is set among aspen and Jeffrey pine on the banks of Bishop Creek South Fork with a broad meadow opposite. The nearby trailheads take hikers to Tyee, Green, Brown, Treasure Lakes and the Chocolate Lake loop on the Bishop Pass trail. This is another small campground and the last place you will come to where overnight camping is allowed before reaching South Lake at 9,768’ above sea level (ASL). Willow campground has 8 campsites and is not recommended for RVs and trailers. Here too one vault toilet is maintained for campers and water should be brought in or filtered from the stream. 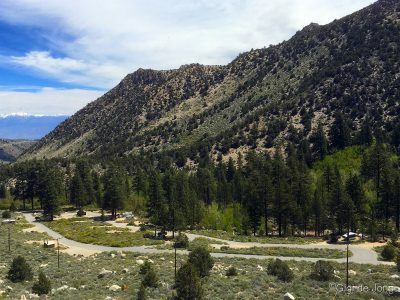 The campsite is set at little back from South Lake road and a 2-mile trail connects the campground to the Bishop Pass trailhead at South Lake. This campground is open seasonally for summer and was not yet open at the time of publishing. 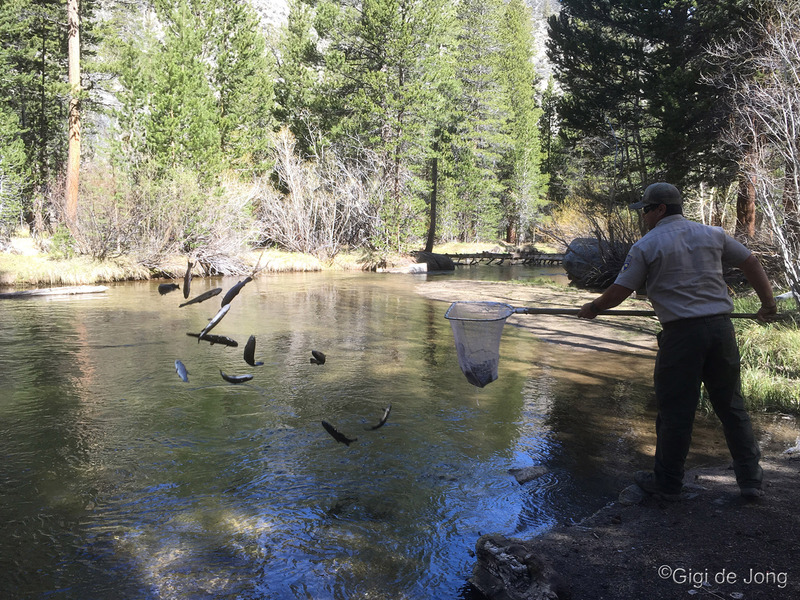 16 Miles from Bishop on Highway 168 toward Lake Sabrina is a small and very popular fishing lake – Intake 2. Frequented by day visitors this recreation area has a number of lovely picnic sites and two small campgrounds. Lower Intake 2 is a small walk-in campground on the west shore of the lake with 5 sites available for tent camping. Less than ¼ mile further along the lake drive is Upper Intake 2, which has 11 campsites best suited for small vehicles. The sites are secluded and shaded and facilities include flush toilets, drinking water, and trash removal. This lake is the lowest in elevation (at 8,103’) in Bishop Creek Canyon and is managed by Southern California Edison. It is well stocked for the fishing season and provides wheelchair access for fishing. The large parking area for this group campground is just beyond the drive for Intake 2 and overlooks the Bishop Creek Middle Fork here. The camping area is accessible by a set of rough-hewn stairs where the site accommodates up to 25 campers in tents only. Drinking water, flush toilets, picnic tables, 2 bear proof storage containers, and fire rings are provided at the site. Reservations are required at least 4 days in advance with a two night minimum stay over weekends. Up to 8 vehicles are allowed in the parking area and no camping in RVs is allowed in the lot. 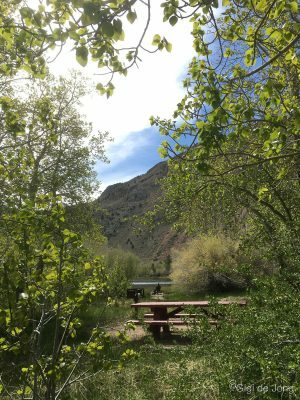 This is one of the most popular campgrounds in Bishop Creek Canyon. There are 21 campsites with most being best suited to tent camping with walk-in access. A few can accommodate vehicles, but large RVs and trailers are not recommended. The sites are situated right alongside the Middle Fork of Bishop Creek and some are large and grassy. Amenities include flush toilets, drinking water and trash removal. Bear proof food storage units and picnic tables are provided at each site. Almost directly across from the group site this campground is connected to the mountain community of Aspendell along Bishop Creek Camp road to Cataract road at the south end of the little town. Cardinal Village Resort, at the north end of town, has a quaint general store and lovely café for some special treats. The village maintains a picturesque pond where kids can safely, and likely successfully, cast for trophy trout. The last campground along Highway 168 before you reach the lake itself at 9,128’ ASL is Sabrina Campground. It is about three miles downstream of the lake and has 18 campsites. Most of these are alongside the creek and offer a mix of sun and shade. The majority are best suited or reserved for tent camping and a few will accommodate RVs. Half a mile beyond the North Lake road turn-off is the entrance to the campground. This drive does connect to the North Lake road, but larger vehicles will have easier access and better ability to turn around by entering from the southern end. As with all the USFS campgrounds in this canyon bear proof storage units and picnic tables are provided. The other services here are vault toilets, drinking water, and trash removal. At the time of publication this campground was not open. Situated above the highest of the lakes in this canyon the North Lake campground is accessed via a partially paved, partially gravel road that twists and climbs its way up the side of the mountain to North Lake (9,350’ ASL). Tall Jeffrey and Lodgepole pines grow abundantly in this cool, shady campground. Parking at the campground is reserved for paid campers only and some of the 11 sites have parking at their respective sites, while others are a short walk in. Trailers and RVs are prohibited at this campground. Parking for day visitors and overnight wilderness hikers is available at North Lake. Campers are requested to pack out all trash as no bins or removal service is provided here. Drinking water, a vault toilet, and bear proof storage bins are provided. In addition to these beautifully situated and excellently maintained campgrounds there are a number of lovely resorts, outfitters and commercial services in the Bishop Creek Canyon area. More about these in another blog post. Highway 168 – Line Street west will take you up into the Bishop Creek Canyon wonderland. About 15 miles from town a left turn will take you alongside the South Fork and deposit you in the parking lot at South Lake. Beyond the turn-off for South Lake the road winds through Aspendell and up a steep grade to the turn-off for North Lake. Further on the road becomes narrower and terminates at Lake Sabrina. The two main roads, Highway 168 – Line Street and South Lake Road are paved and in very good condition. The drive up to North Lake is a little less so and quite steep in places. Before you head up into the mountains stop in at our Bishop Visitor Center at 690 N Main Street. Our friendly, helpful staff can answer your questions and provide maps to help you plan the best possible camping adventure. Day hikes in the area do not require permits, but should you need a permit for overnight wilderness trips pop on down to the US Forest Service office just half a block north of us on Main Street.